The 48”W x 72"H Infiinty Showcase - Ready To Assemble is a modern classic that will give you years of affordable elegance and dependability for your retail store. 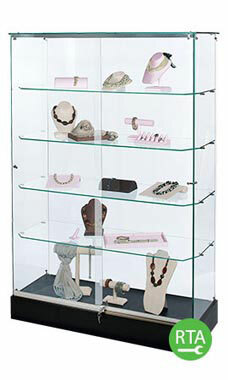 Our seamless case offers four levels of display space and lots of glass display. Our case features a durable black melamine laminate finish with tempered 1/4" glass on all for sides of the unit. Additional features include 4 rows of 1/4" tempered glass shelves and a lock. Ships unassembled!